The only sprayer with a 5 year guarantee! 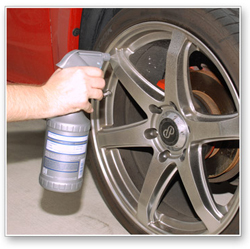 The SprayMaster® Heavy Duty Spray Bottle is the ultimate sprayer for detailing. The sprayer has a high output nozzle with a fully adjustable spray pattern. Dilute glass cleaners, all purpose cleaners, and other chemicals in the chemical resistant SprayMaster®. Every detailer needs this sprayer! What sets the SprayMaster® apart from other spray bottles? The SprayMaster® is built for rigorous use with a wide variety of chemicals. The spray nozzle and bottle are constructed of superior chemical resistant materials that are compatible with the widest possible range of chemicals. The bottle has extra thick walls for maximum durability. The SprayMaster® Heavy Duty Spray Bottle is ideal for delivering a high volume of cleaner right where you need it. The sprayer is fully adjustable and outputs 2.65 cc per stroke (~ 0.9 fluid ounce). The bottle features a patented back off resistant cap, which means that the spray cap stays tight on the bottle, preventing leakage. The back of the bottle has a check-off grid for identifying the bottle contents. This is a smart feature that will take the guesswork out of storing products in secondary bottles. 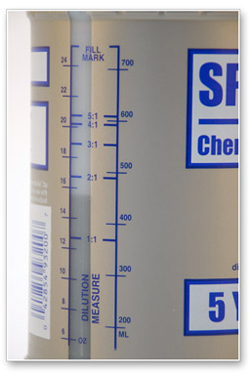 A handy graduation scale on the side makes it easy to dilute concentrated detailing products. The SprayMaster® Heavy Duty Spray Bottle is easy to spot in silver and blue. This will quickly become your favorite sprayer for fast, efficient detailing. Only the SprayMaster® Heavy Duty Spray Bottle comes with a 5 year guarantee! 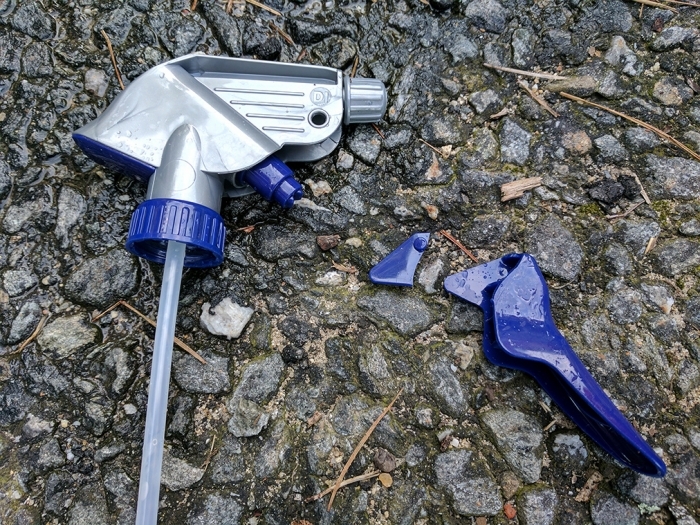 That's a testament to the durable construction and premium materials found in this sprayer. The SprayMaster® is more than a spray bottle; it's a smart investment for any detailer! The sprayer only (SM-GB3001V8) can be purchased separately at the bottom of the page to be added to your own bottles. Bottle is made of sturdy plastic and the trigger seems sturdy too. much liquid is in the bottle. Used it for 5 minutes and the trigger broke. Only got through spraying half my car with Hydro2. Ended up switching over to a cheapo household spray bottle to finish the job. Save your money and buy something else. Hoping that I will be able to get a refund without sending it back. ConsWeak trigger breaks too easily. Ok, for starters, it's a tough bottle, and sprayer seems beefy. But, wtf with the dilution window? It's gotta be me. But here it goes. I think you fill with water to your desired ratio, like 4:1, then product to the fill line at the top of the scale. Right? Wrong. That's not 32 oz. Measured it out, and 32 is up the neck a bit. That means your dilution will be to the stronger side. Right? Can someone clarify this for me? ConsJury still out on the dilution graduation and capacity. This is not the first time I purchased the SprayMaster , I own several of others from years ago , I like them so much I purchased this one I writing a review on . Good quality , pump is still working strong on my older ones . I like the measurement window on the side it shows ounces , ml and my favorite is the mixing ratio . I like the blank labels on the side so you can write down the product you have inside .